So basically I created this post because something must be done about current Survival Rep Table while referring to the current player base of this game mode. On open world I can easily get Warmonger in like 1/2 days only while entering server and grabbing the loot form the ground.Players like WLSpartan,Geneticz,Kaz etc would for sure get even more. On Survival it took me 4+ months to get warmonger while on ow as i said - it would take me only 2 opr 3 days to do that. Even my friend MATRIX who is rly good survival/ow player have -17k rep for past month and on ow guy have 163k rep which is 9 times better than my friend's score. Another case is that there are NO players on survival which is making things even harder.Servers are mostly empty and sometimes when there is 50 ppl on the server only 5/6 of them have at least 1k rep while they are spreaded across the map which makes PvP even harder.The thing is It would take years to get -200k rep on survival which makes ppl don't want to grind anymore.Thats why i suggest changing rep table and decreasing the values needed to get certain Ranks.And please take my request very serious because this is important stuff,stuff that matters and this comes from experienced Survival players and ppl who i play with/against. Here is an example of possible rep table. jsut so you an see what i mean. ive been saying they need to separate pvp server REP and open server REP. there has been a huge boost in rep because of the "new system" . I get accuse of cheating alot because these guys have monster ranks getting wrecked by a warmonger... I very rarely leave my private AR only PVP server. im thinking they will hopefully look into it.. I wouldn't mind a reset and separate ranking system. Hey guys thanks for your feedback and opinions! Myself and Chupa actually tackled this very issue and have come up with an updated table for the negative and positive reputation tables. 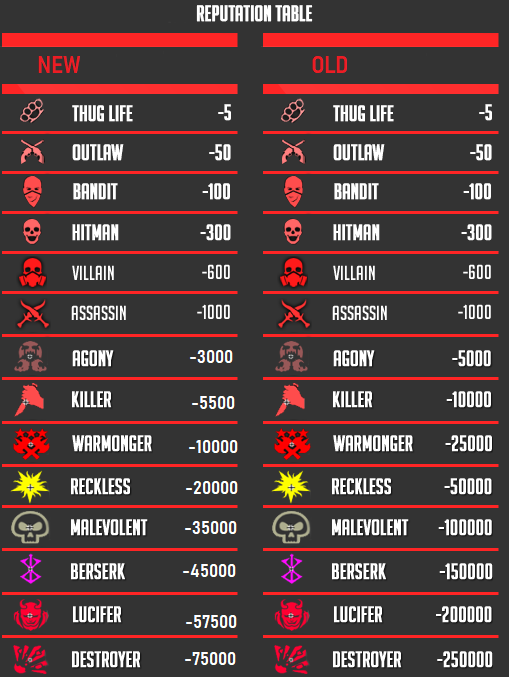 That also includes icon changes/updates, new names/ranks (mainly for the positive side), updated reputation gain/loss depending on who you kill respectively (for example if a paragon kills another paragon he loses a large chunk of reputation. In addition to all that the new proposed tables include slight adjustments to the rep requirements where we felt it made sense or was needed. I can't comment on the separate reputation tables since that would require a discussion from the community and within the staff team, but i'm sure it can be discussed at some point. Sorry I wasn't able to provide exact information in this post but my goal was to assure everyone things are getting looked into, but recently with the crash issues and other major problems concepts like these take a backseat until everything is resolved. I have 80 k rep after year of playing and months of try harding. Max monthly rep for survival is around 10k. Time has come to finally rework rep chart because this is one of many reasons why survival is dead. Some ranks will never be obtainable. I agree with @SurZeus , we need to rework rep table, its should more easier to get those ranks. I suggest to create a new rank for civilians. If a civilian have, for example, -3 rep, the civilian icon turns into red civilian icon. if have, for example, +3 rep, the icon becomes green. This is good for who want focus to kill only outlaw or only the law players (Survival, or even OW). But why do you guys care so much about rep ? Rep its like a goal, when you reach bandit, for example, you want do reach next one....and so on! this estimulate players to play more and more, cuz its a objective!